A pack of brass boat canopy eyelets complete with cutting and installation tools. 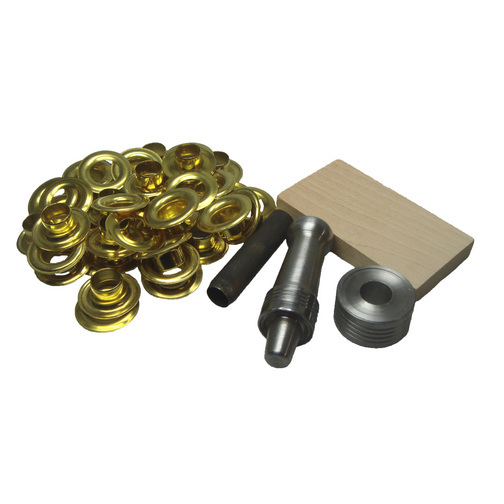 This collection of brass eyelet grommets are useful for adding additional eyelets to covers or can be used for repairs. The cover eyelet kit comes complete with the installation tools required including a cutter, an inserting handle and a eyelet base. These eyelets can be used on boat canopies, boat covers, awnings, sails, flags, banners and even around the home for covering lawn furniture, patio and pool covers and shower curtains. They can be useful for additional eyelets in caravan covers and winter cover installations.